Now that site speed is an SEO ranking factor, it’s more important than ever that your site runs fast. I’m delighted to announce an updated series of performance testing tutorials in Level 4 of my Webmaster Training courses. WebPage Test is my workhorse tester. You can run multiple concurrent tests for accurate results. Everything else is a one-off tester that you have to run over and over and manually average. Speed results for multiple load times – on_load, load, and full load. Other testers just run to the on_load point, which is only above the fold and doesn’t tell you all you need to know, and will make you think nothing is wrong with your site speed. Multiple testing conditions and locations – run from anywhere in the world and on desktop or mobile. This is crazy important now that Google considers the mobile version of your site as primary. Detailed analysis of content types – you can see the number of requests and the byte size to easily spot the resource hogs that are slowing down your site. Image optimization – there is a standalone section to see all of the images that are loading on the whole page and how well each one is optimized. See my Image Optimization Test tutorial for more. Learning to read the wealth of the testing results that WebPage Test gives you is the real key to making the most of it. My new tutorial series covers each section of the results, along with good, bad, and ugly examples of what to check. 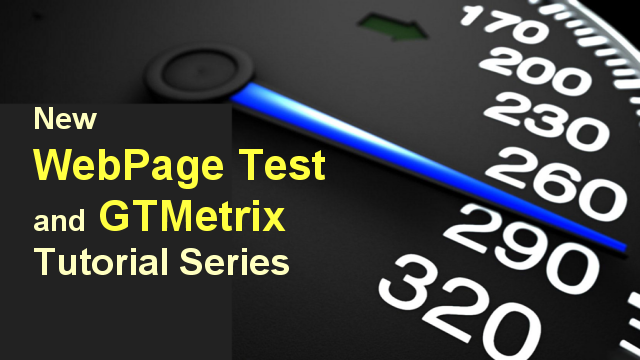 GTMetrix is a wonderful companion tester to WebPage Test. The new tutorial series covers all of the extra features and testing conditions you get with a free GTMetrix account. These include features for better mobile testing too! The tutorials cover how to run accurate tests and interpret the results. Plus, I show you all the unique and hidden tools for even deeper info and troubleshooting that most folks don’t even know exist on the tester. One of the best features of GTMetrix is the ability to see groupings of site elements that could be improved for speed. It’s a super quick way to identify the tweaks you can do on the site to make it faster. The new performance tester series is part of full site audit training for webmasters. You need to see all of the performance drags on the site. That includes security issues, as security and performance go hand in hand. You don’t want all of your hosting resources to be chewed up by bots and resource hog plugins. Fixing both will improve your site speed too. And, a full audit keeps you from throwing darts in the dark and making site changes that don’t result in any improvement at all. Designers and Webmasters – get the in-demand skills you need to set up sites securely and make them fast. Site Owners – get an audit and find the real drags on your site.